Never worry about your company's environmental problems again. 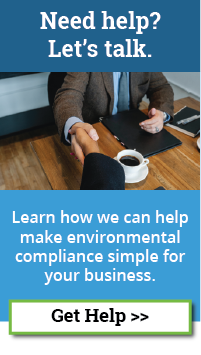 We help you get into compliance with confusing environmental laws, rules, and regulations and stay out of trouble with regulatory agencies and 3rd party environmental groups. We develop environmental management systems and sustainability programs for your company that position youas a leader in your market or industry. We conduct Phase I Environmental Site Assessments to help you avoid environmental liabilities and prevent you from making bad investments. Need help with environmental permits or approvals? Ready to embrace sustainability and improve your bottom line? Are you buying, refinancing, or selling a piece of property? Does your staff or organization need environmental training? Do you want to stay free from regulatory issues & create an environmental program people talk about? We call the Garden State home, and offer some New Jersey specific environmental services. Are you looking for a passionate & energetic environmental speaker for your next event? Are you wondering if we can work at your operation? We've worked all over the map, including internationally, and would be happy to come work for you, wherever you call home. Most facilities and industries are faced with unique environmental problems. Fortunately, we've helped thousands of people like yourself across various industries, and can help you too. Would you like to know what our services cost without having to pick up the phone or fill out a form? No problem! Learn what you can expect to pay when you hire RMA. We believe in a greener tomorrow. But without you, we'll never get there. That's why our primary goal is helping you and your operation. Your success is our business. Whether you're looking to stay ahead of the curve, or struggling to keep your head above water, we can help. Too many environmental organizations deliver a product that places unrealistic demands and expectations on you and your employees. They assume you're just as passionate and knowledgeable about the environment as they are. We know that's not true, and that's why we pride ourselves in delivering environmental solutions that you and your employees can embrace and understand at your workplace.